This project will be worked on by Lunar_Song and I, the script is being worked on as of Monday, Jan. 23. I will add more roles as we go. This is my first time making one of these and very excited to be doing this. If you notice any mistakes, please pm me to let me know. Thank you, have a nice day. Spike is Twilight's assistant and closest friend. He is a dragon. Hi, I'm Spike the Dragon. Twilight, aren't you going to join the party? Any background ponies with very minor parts. Say a line from the show. Rainbow Dash is a speed loving pony who represents the Element of Loyalty. She has a pet named Tank. Also her voice is a little scratchy. Pinkie Pie, can you make me a cupcake? AppleJack is a southern pony who represents the Element of Honesty. She has a pet named Winona and loves apples. Rainbow Dash, this race aint about winning, its about having fun. Pinkie Pie is a fun loving, spontaneous pony. She loves to party and has a high pitched voice. She has a pet named Gummy and represents the Element of Laughter. Fluttershy is a shy, quiet pony that represents the Element of Kindness. She loves animals and has a pet named Angel. (gradually getting quieter) Hi, I'm Fluttershy. Rarity, do you need me to watch Opalescence while your in Manehatten? Rarity is the Element of Generosity and loves fashion. She has a mild hint of british in her voice. (shocked) Darling, what happened to your mane?! Twilight is the Princess Of Friendship and loves books. She is kind of a nerd, but we love her for that. Hi, I'm Princess Twilight Sparkle. 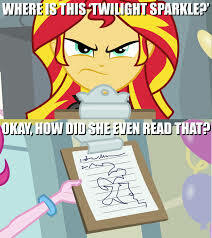 Dear Princess Celestia, (improvise a letter) - Your Faithful Student Twilight. Discord is a Draconaquus who's best friend is Fluttershy. He was evil and also easily manipulated. He will do anything for Fluttershy and I do mean anything.